It’s basic marketing know-how: offer a proposal, then deliver it to your audience. 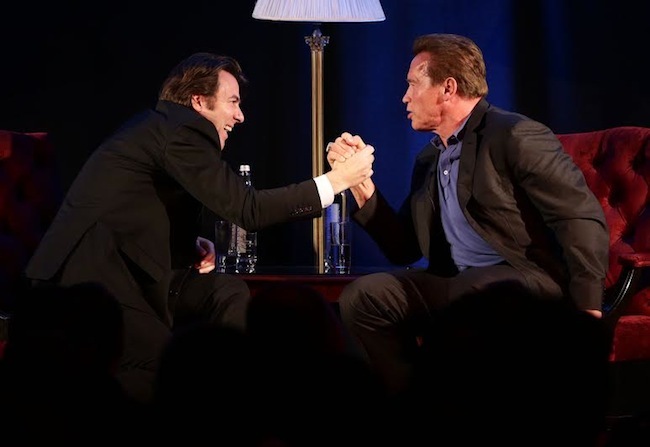 In the case of An Evening with Arnold Schwarzenegger, the proposal was two-fold. First up, there was the intro video that promised we’d see another side of Arnie. A new Arnie that would stray from the heavyweight Arnie, film star Arnie and Arnie the Governor. Opposing that was a simpler, more predictable and straight-laced proposal offered by Arnold himself: Arnie, live. As he is in the movies. At The Lancaster London Hotel this past Saturday, it was ‘Arnie The Great’ tens of journalists and a couple of hundred fans were presented with. Not Arnie: Behind the Scenes or Arnie: Derailed as marketing material promised, but Arnold Schwarzenegger as we know him, the figure that cut his teeth as a teenager in Austria, then in London’s east end, then in the US, winning seven Mr Universe titles in the sixties. It was an unprecedented feat for a young man born into post-war hostility and a society telling him no at every turn. He went on to star in movies, didn’t you know? Terminator 1 and 2, a franchise that featured third and fourth not-so-solid turns – host Jonathan Ross playfully quipped on this – then comedies like Twins with Danny De Vito exposed him as actually funny, even if the whole schtick was generally a little odd. But action smash hits garnered his fame and fortune: Total Recall, Predator, True Lies and Conan the Barbarian proudly foster his name, the latter of which began his career in film in 1982. Then, onwards to Governor of California, and those hilarious adverts mocked to death on Youtube. His is a career of trembling highs, barely any misses and fists (and fists) full of self belief. Sitting through a ninety minute sonic drenching at the mercy of Mr Schwarzenegger reveals that he’s also a charmer. He is gracious, of-the-world (Mile End Road comes up in conversation, Arnie-initiated…) and self-effacing at times; even if he has a box set of fail-safe pick-me-up stories to swoop in with and plaster up salty wounds, of which there’s been a few: most notably an affair with the family nanny in the late nineties. From on stage chit-chat to audience questions, the whole Arnold experience was enlivened by armies of hooting muscled and bronzed male fans of no particular age, some in their teens, some in their sixties, all of whom interested only in the Arnie story they knew well. It was delivered with panache by the man who seemingly charmed his way to the top of most things – and his story and delivery of it is genuinely insightful and full of inspiration. Arnold gave his fans what they came for, but it’s a shame Arnie Point Four wasn’t a topic: Arnie post-workout, post-movies and post-politics. A gentle probing of Arnie in old age would have unearthed something new, but for now, Schwarzenegger has a short-term opt-out: his next moves are back in movies. He is soon to star in another Terminator, a second Twins and another Conan epic – but this is his least interesting phase; his joyride, a journey without the challenges of his pasts. Yep, he’s still doing his own stunts, and he assures us he still works out twice a day at 67 – we’re impressed – but more impressive would have been a frank look at Arnie soon-to-be in his seventies – he’s passionate about climate change and green energy, issues hinted upon at the talk’s end – but does the man who grasped the world in his teens have more great and unprecedented turns left yet? For this chanting thousand it hardly matters – he said “I’ll be back” like 7 or 8 times in an hour so they’re set for life, and regardless of new turns, brand Schwarzenegger is still turn-ing.